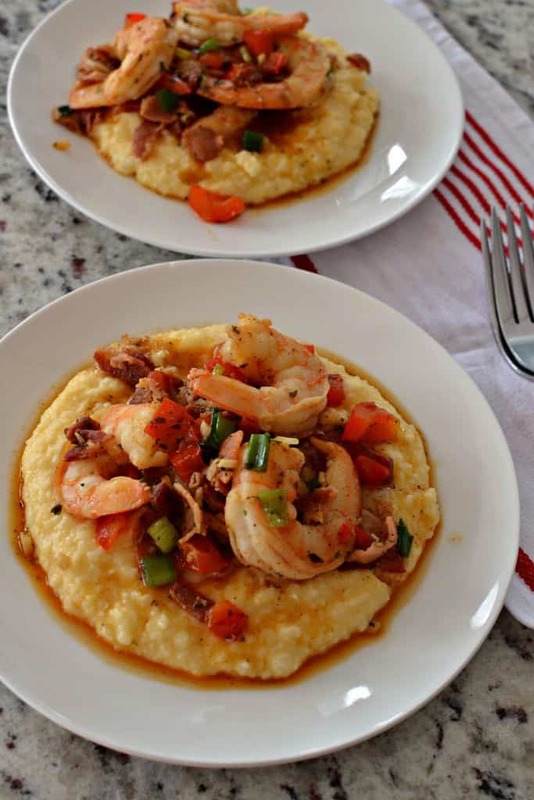 These delectable Shrimp and Grits will leave you licking your plate and longing for more. 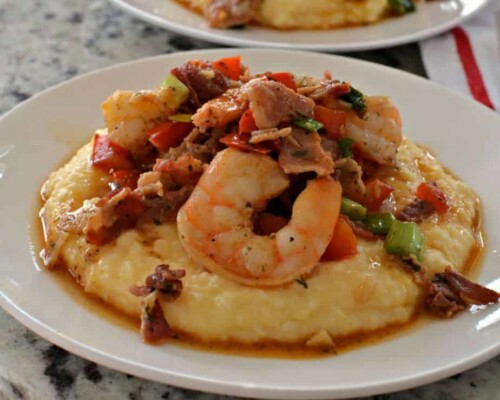 The shrimp are skillet cooked with Cajun seasoning, red pepper, green onions, crisp bacon and garlic all spooned over a bed of creamy cheddar grits. This dish comes together quite quickly and is a family and friend favorite. So against my better judgement as far as common sense is concerned I have been cooking and creating some southern recipes. When I say southern (at least in this case) I am referring to Louisiana Cajun and Creole recipes. Don’t get me wrong I love what I have created and by the way so do my taste buds. The people from this southern region really do know how to cook and they are extremely passionate about it. They take their recipes and cooking so seriously that I will receive emails and comments here and on social media about how I should have done this instead of that. The comment will read something like this, No! No! No! It is this ingredient and not that one. Oh well I love to cook and I think this Shrimp and Grits Southern Style is my new favorite recipe! If you are from Louisiana and you are reading this post please cut a Midwestern girl a little slack. I know that you all take your cooking seriously! I get it however cooking is about adapting and changing a recipe to your own taste, wants and regions. No one here in the Midwest thinks they have the end all be all for toasted ravioli. Though we were the first to drop it in a fryer and make that crispy treat go national. So if you want to stuff those ravioli with crawfish instead of beef and sausage go for it! Why not dip them in a Cajun Remoulade Sauce instead of tomato sauce! That would be delicious and they could still be called toasted ravioli and everyone would love them! How do you make Shrimp and Grits Southern Style! First lets get the grits started and the shrimp peeled. Boil the water and add the grits and salt. Cook until tender and remove from the heat, stir in the butter, cream and the cheddar cheese. Meanwhile peel the shrimp removing the tails, and devein if not already done. In large skillet over medium heat cook bacon until crispy. Remove to paper towels to drain. Once cooled coarsely chop the bacon. Do not clean the skillet or remove the bacon grease. Over medium heat add the shrimp, sprinkle with creole seasoning, cayenne pepper and parsley. Cook for about one minute per side. Remove and place on plate. Heat a little canola oil over medium heat. Add the red pepper and cook for one to two minutes. Add the green onion, garlic and cook for additional one minute. Spoon the bacon and shrimp back in the skillet. Add the chicken broth to the skillet and stir to combine. Spoon over the cheesy grits and serve immediately. Chances are that you are not from the south if you are wondering what grits are. Grits are made from ground corn, usually dent corn. This particular corn is more starchy and less sweet than most varieties producing a smooth and creamy texture when cooked. From there you will find three types of grits, stone ground grits, quick grits and instant grits. Stone ground grits are coarsely ground therefore producing more corn flavor but less creaminess. Since they are less processed store them in the freezer. They take about forty minutes to cook so plan accordingly. Quick grits are ground much finer than stone ground grits. These grits cook up creamier and smoother than stone ground grits in about five to seven minutes. They are usually found in the same grocery aisle as the oatmeal. These are the grits that I use for this recipe. Instant grits are precooked and dehydrated so all you need to do is add boiling water. They are in little paper packets like instant oatmeal. Instant grits do not have as much flavor as stone ground or quick grits. They are perfect for a super quick breakfast but I do not suggest them for this recipe. 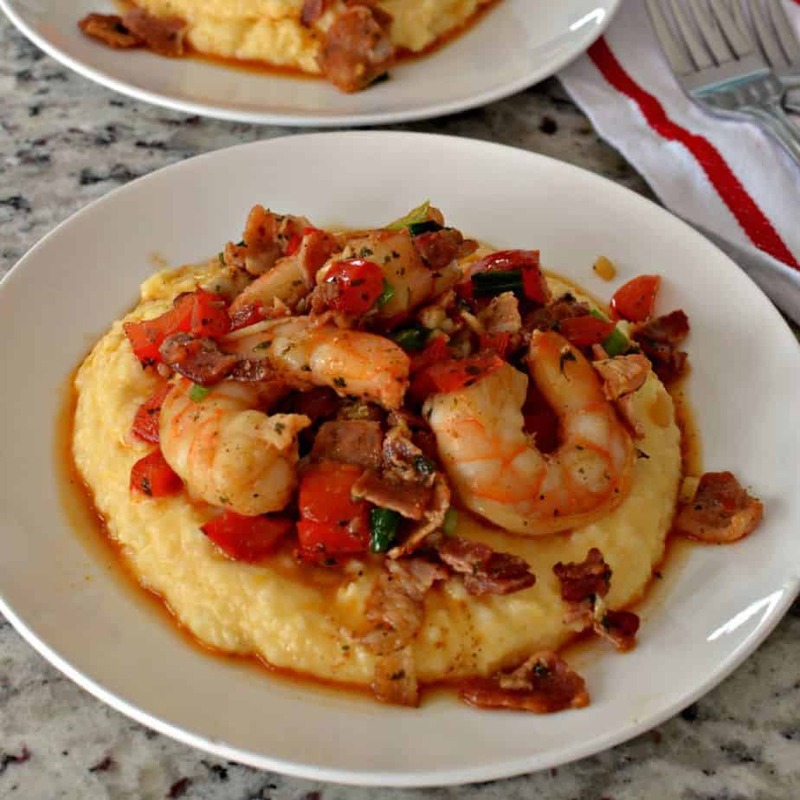 Helpful hints to make this Shrimp and Grits awesome! Quick grits works best for this recipe. Boil the water then add the salt and grits. Bring back to a low boil and stir to combine. Cover, turn to simmer and cook until tender and creamy. Stir in the cream, butter and sharp cheddar. It is just that simple. Use good quality smoked bacon and don’t throw out the bacon grease. Use fresh water large peeled deveined shrimp. Place them over medium heat in the bacon fat. Don’t overcook them. They only need about one minute on each side. They will be added back to the pan in the second part of the recipe. Sprinkle the seasoning on the shrimp while it is in the pan. It is easy to do and works to sear into the shrimp. Serve this recipe as soon as possible. Shrimp does not reheat well. It can easily get overcooked and rubbery. 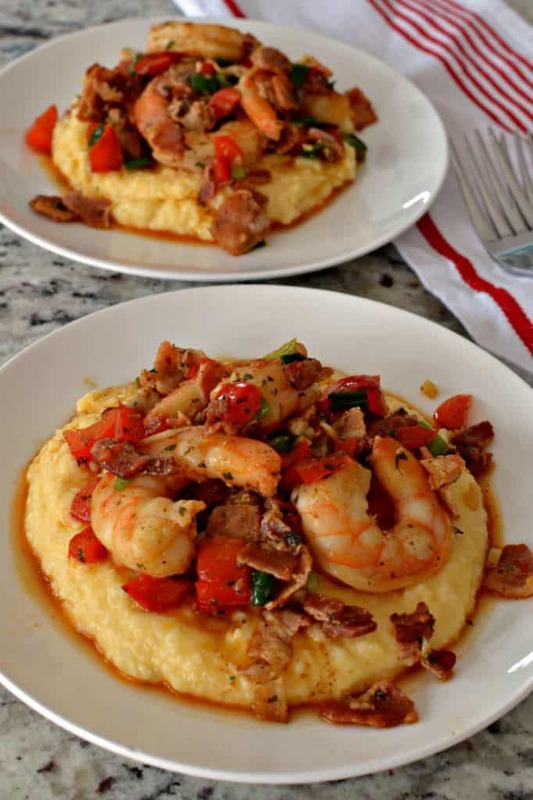 What is the best shrimp to use for Shrimp and Grits? 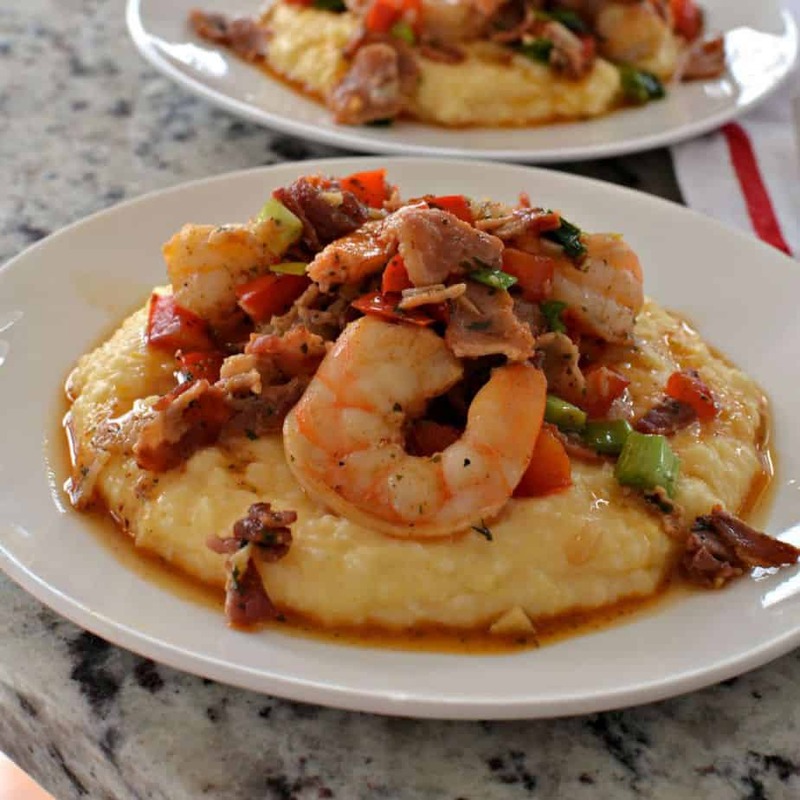 I love to purchase 21-25 count per pound wild caught shrimp for this recipe. Chances are they are frozen or previously frozen (then thawed for sale). Almost all shrimp come in frozen even if they are presented at your neighborhood seafood counter (unless of course you live on the coast). They may come peeled and deveined which saves you a little bit of time. These shrimp are the perfect size for this recipe and are super tasty. 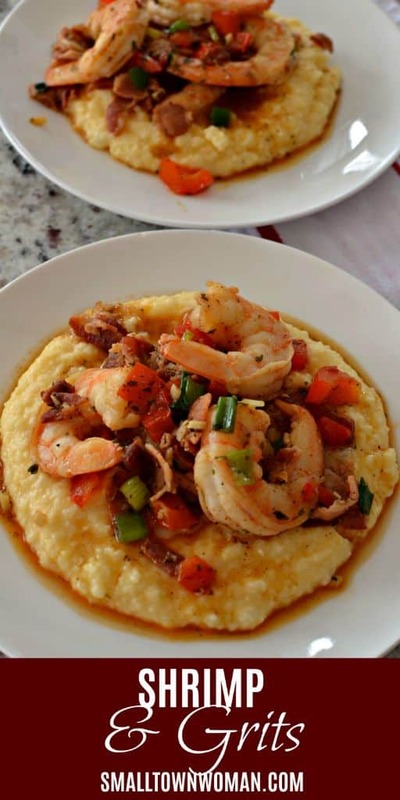 These delectable Shrimp and Grits are cooked with creole seasoning, red pepper, green onions, crisp bacon and garlic over a bed of creamy cheddar grits. Bring the water to a boil; add the grits and salt. Cook for 5-7 minutes or until tender. Remove from heat, stir in butter, cream and cheddar cheese. In large skillet over medium heat cook bacon until crispy. Place on paper towels to drain; reserving bacon grease. Coarsely chop bacon once cooled. Add shrimp to bacon grease over medium heat. Sprinkle with Cajun seasoning and cayenne pepper. Flip shrimp after one minute; and cook for additional one minute. Remove to plate. Add vegetable oil to skillet over medium heat. Add red pepper and cook until slightly tender; 2-3 minutes. Reduce heat to medium low. Add green onions and garlic and cook for 1 minute. Add chicken broth to skillet and stir. Return shrimp and bacon to the skillet and heat for 1 minute. Spoon shrimp mixture over cheesy grits. Serve immediately. Thanks so much Charlotte! Glad that he liked it!! Yes it most certainly can however cook the chicken longer than the shrimp to make sure it is done. Have you made a Louisiana dish called ‘Shrimp Delicate’? My wife and I have had it at a diner in Baton Rouge 3-4 times while passing thru. They told us it was a La. favorite but when Creole / Cajun recipes are featured, this is never mentioned. It is an unusual recipe for shrimp but we are hooked. I would love to know how a professional would make this dish. That’s it, Beth! It is the beef stew mix that really makes this such a great and unusual recipe. Just bought 2 lbs of red shrimp today and will give it a try on Sunday. Will let you know. Sunday meal was the very BEST! I hope more folks will try Shrimp Delicate. What a great recipe ! Since I make my own creole spice mix , I did not add more spices and this was perfect for me – hubby added Tabasco Sauce to his. We do plan on making this again ! My pleasure Marion! I am so glad that you liked it! We love that recipe! Made this last night and it was delicious! The grits were probably some of the best I’ve ever had. Thanks so much Sandy! I am so glad that you liked it!! I made this last night, but tried to made it more healthy. I microwaved the bacon. I didn’t put salt in the grits and cut out the cream, used I/2 the butter and cheese. I used a little Canola oil for the vegies. It was great, my husband loved it. I am so glad that you liked it. Glad that you modified it for your needs and wants.